The Orly airport is 25km away and the Roissy airport 30km, quick access via the RER suburban train. Bus lines n° 161, 178, 262, 272 and 378, Station: Rouen. Bus n° 73, Station: Léonard de Vinci. Subway line 1, RER (suburban train) line A, Tramway line 2, Station : La Défense (Grande Arche). By train: La Défense station. Trains from Saint Lazare, going to St. Nom la Bretèche and Versailles. 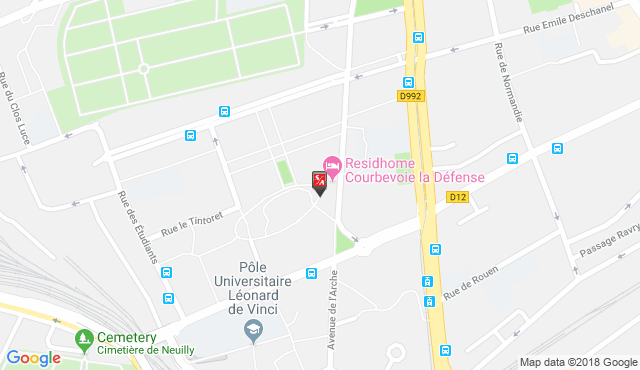 Access by the national road N13, exit : la Garenne Colombes. Exit #6 off the ring road.